I regularly receive new home improvement related items in the mail from manufacturers looking for me to evaluate their products. In some cases I indeed do test them out, and other cases I do not. If I do test out a product that I really like, I usually write up a short review about it and post it on HomeAdditionPlus.com to let site visitors know about a new product that they might find useful. To that end, I am writing today about a new pair of Snap-On SuperGrip work gloves that I recently tested out on a number of projects around my home. When I first looked at the work gloves I was initially underwhelmed. They seemed small and looked more like a golf glove than a work glove. That said, little effort was required to evaluate them as all I needed to do was put them on. And so I did. And to this day I have continued to use them on various projects around the home and have been quite impressed with them. There are a number of reasons why I have grown attached to my new Snap-On SuperGrip work gloves. First, they are very tough yet light weight in construction. Consequently when working on mechanical projects, such as when I was recently assembling a utility cart, they protect my knuckles while still allowing me to easily grip and handle wrenches and screwdrivers. What helps them achieve their excellent grip properties are small silicone fused bead patterns on both the finger and palm areas of the gloves. Though not sticky to the touch, the silicon beads provide a fantastic grip surface when holding steel, plastic or wood handled tools. I also used the work gloves on a number of yard projects. I recently spread 5 yards of bark mulch, where it seemed at times my hands spent more time in the garden beds spreading the mulch than the rake. The Snap-On SuperGrip work gloves held up great and protected my hands from getting all scraped up and blistered. Unlike most other heavy duty work gloves I also noticed that while wearing the Snap-On SuperGrip work gloves my hands did not become sweaty or clammy feeling. The gloves also held up very nicely. After repeated snags on shrubberies they did not tear or become damaged in anyway. 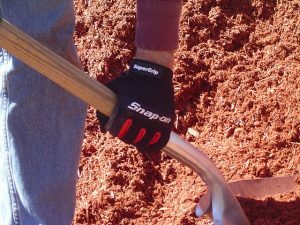 So if you are in need of a new set of garage or yard work gloves I would certainly recommend trying out a pair of Snap-On SuperGrip work gloves. They are tough, yet light weight to provide the dexterity that is often lost with other work gloves. You can find them at Auto Zone or Pep Boy stores. One final word, they do seem to run a little small. So I would recommend trying a pair on before just grabbing them off the shelf and buying them.